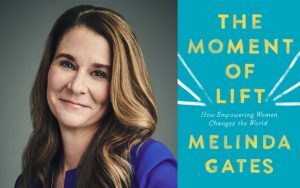 Philanthropist and businesswoman Melinda Gates makes her literary debut with The Moment of Lift, exploring how female empowerment contributes to the betterment of society. Gates intertwines her own journey with stories of women around the world, passionately advocating for gender equality and blazing a trail to a brighter future. Special bonus: a copy of The Moment of Lift is included in the ticket price. There will not be a book signing for this event.